Drive on Moscow is the next iPad wargame coming soon from Shenandoah Studio – makers of the fantastic Battle of the Bulge iPad wargame that was one of our picks for the Best iPad Apps of 2012. It’s only been a couple of weeks since Drive of Moscow was announced, but it looks like development of the game is storming along like the German army before winter set in. 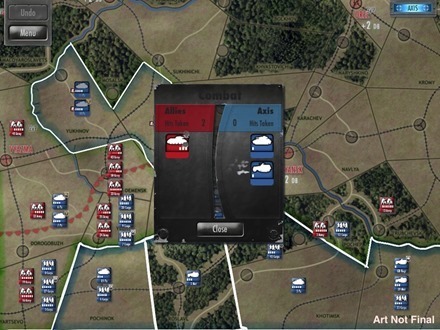 Shenandoah has posted the first Design Diary entry for it on their blog, focused on the order of battle for Drive on Moscow. The diary post includes some early stage game screens / game art. The post is a great read in itself and gives some insight into all the hard work and research that goes into these titles. And the game screen images are great to see of course. You can definitely notice the larger number of units available here, as compared to Battle of the Bulge. I’ve said it before and I’ll keep saying it until Drive on Moscow is released – I can’t wait to play this game. Check out the first Drive on Moscow design diary when you have a chance.